Choosing the right web hosting company is one of the first crucial things for starting your online business. A good web-host will ensure that your site remains up, and you don’t need to get into any tech hassles including hacking or managing your hosting space. When it comes to WordPress shared hosting, there is few popular name out there like Bluehost, Hostgator, Dreamhost and so on. In the last ten years, I have tried all of these hosting companies, and I know what are the pros and cons of each. 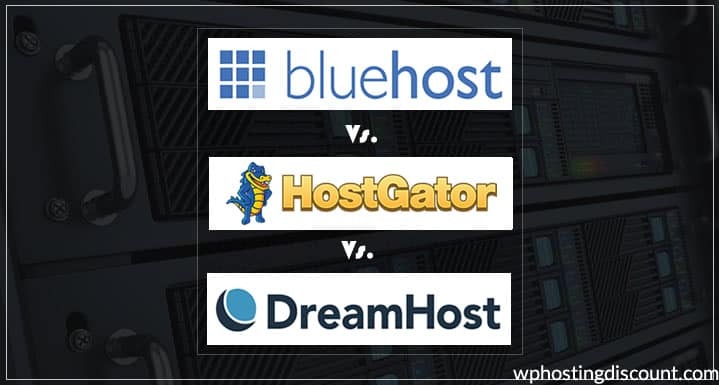 Also see: BlueHost Vs HostGator for WordPress : Which is Better? One major problem that a newbie faces is, deciding which hosting to buy in between these three. Since all of them have a good reputation and great uptime. Like any hosting, they do have their downside like Dreamhost support is not as good as Hostgator or Bluehost. Do remember, I have only used them for WordPress platform, and this article is based on my experience with them as WordPress hosting. All these three Webhosting companies offer unlimited Webhosting resources and are perfect for hosting our WordPress sites. Though, the major difference comes in pricing and support. Dreamhost hosting here offers custom cPanel, whereas Hostgator and Bluehost offer standard cPanel. In 2019, Bluehost also offers custom panel for managing our WordPress sites. Also, on Dreamhost, you will not find Fantastico to install WordPress as they are using the custom script. In this case, I’m considering Baby plan from Hostgator because that has unlimited hosting. I have worked with various Clients and most of the time I work on these 3 hosting. From my experience, I would suggest you Bluehost as it’s also officially recommended by WordPress team. I have used Dreamhost in the past, and it was good, but when I compare it with Bluehost or Hostgator, I always recommend the other two first. What DreamHost lacks is a prompt support like Bluehost. Also, both of them offers free domain and free AdWords coupon. In the term of the resource provided with the package, both are equal and good. Major different comes in Quality of service, where BlueHost is two steps ahead of Dreamhost. So, my recommendation is BlueHost over DreamHost. DreamHost Web Hosting is useful when you are in limited budget and need a super budget hosting. On BlueHost you can get one year hosting + 1 domain for around $60, with the below-discounted link. So the price is also a driving factor, and if you were looking for a choice between these two, I would recommend opting for Bluehost for better peace of mind. Among these three hosting, if you were looking for a single recommendation, I would suggest buying hosting from BlueHost. BlueHost has done an excellent job in recent time and now offers various hosting package. You can start with their shared hosting, and when you need more resources, upgrade to their VPS or dedicated hosting package. Do let me know which shared hosting you like the most and why? I have a correction to make, the comparison table specifies 3 plans for HostGator. Baby & Business allow unlimited but I doubt if you have unlimited domains for hatching. Could you please confirm the same? Thanks for the tip. It was really help as I’m looking to move to Word Press for my blog. Have you looked at these companies? Mahesh Wpwebhost is nice and it’s a part of our recommended WordPress hosting. I have seen the page.ly ads and social media promotion and they are good but pricey I would say.. I am missing speed and backup plans here. Don’t care about free adwords as long as the server or response time of the server is slow ! Meanwhile Dreamhost allow personal backup!! I’ve been using dreamhost server from the last 3 years and I found them good. Really, no major problem at all. In between, I tried hostgator also, and their support timing is best. They immediately answer your query like they are sitting just for you. Dreamhost support is Ok. But I switched back to dreamhost as Hostgator has limitation as far as some PHP modules are concerned. Dremhost site says 2.95 dollars a month! Rest all is as same as hostgator! Hostgator is dumb, I am having an issue of migrating a DB that is around 50MB to Hostgator and after 10 emails conversation issues is not resolved yet. They have limited everything. Also, I would like to know how I can migrate a big DB.. I have heard about Bluehost that the server crash and there are many problems adopting this one as compared to Hostgator is it true please tell !! Thanks for sharing this awasome post…. All three have some pros and cons,, Most people recommends Blue host and Dream host, Even WordPress also recommend these two. Very effectively compared and elaborated post. Thanks for sharing. I am using host gator and its one of my best hosting.. I have read you blog and found amazing information about these web hosts. All three are fantastic web hosts that offer wonderful hosting services and help in generating massive traffic on the websites. But, I want to know that Wp Engine is also as much powerful web host as these popular web hosts or it could not result in reliable performance like these three? Do reply me as I am having the free coupons for using services from WP Engine. I found your blog so much useful…But I want to ask that how many extra plugins can I use for getting wonderful performance from the hosting services of these companies….. Thanks for this lovely review. The three web hosting companies are great in their own way. I have used Hostgator and BlueHost and must say they are both reliable and efficient. But BlueHost has a little edge over Hostgator in terms of speed.I can comfortably recommend them to anyone because of my personal experience with them. I have been using Hostgator since 2009 and they have not disappointed me. Their customer support is great. However, I have not used Dreamhost, though I heard they are also good. From your comparison chart, they have the least rating. But looking at the features closely, the differences between them and Hostgator are really not much. I am sure some people would find it comfortable to go with them. Thanks once again for the review. Do have a lovely day.